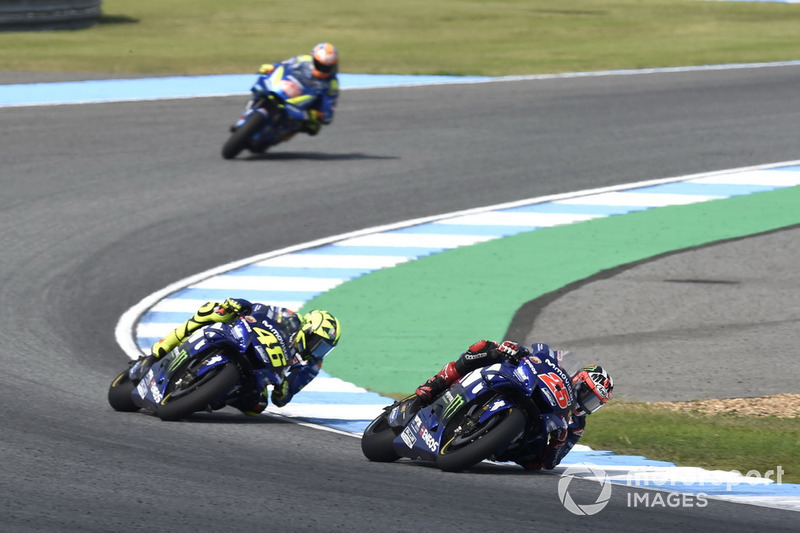 After a particularly insipid showing in Aragon, where Rossi and factory teammate Maverick Vinales finished eighth and 10th respectively, the works Yamaha racers enjoyed much more competitive outings at the new Buriram track last weekend. Rossi qualified second behind race winner Marc Marquez and finished fourth, one place behind Vinales, who secured the Iwata manufacturerâs first top-three result since before the summer break at the Sachsenring. But despite matching his best result of the second half of the year, Rossi said Yamaha cannot be satisfied with one good race and must consider the context of a sub-par latter half of the campaign. âThis is unfortunately a risk [that Yamaha thinks it has solved its problems], but it is a losing mentality,â he said. Rossi admitted that Yamahaâs strong form was unexpected, theorising that the grip of the Buriram track surface could have contributed to the teamâs strong performance. âOn paper this track is not a Yamaha track,â said the Italian. âI expected to suffer a lot more and to be for example stronger in Misano, but in Misano we struggled. âFor me, more than the layout of the track, is different the grip of the asphalt that helped us, more or less. Rossi enjoyed a spell in the lead of the Thailand race, passing Marquez on lap five, but slipped back to third six laps later and staye d there until he was passed by Vinales in the latter stages. The seven-time premier class champion said he had no answer for his teammateâs late-race pace and conceded the Spaniard did the better job. He recalled: âI try for all the race to save the tyres like everybody, because itâs more [like a] cycling race now â" everybody waiting, sometimes one push for two laps, all the other guys follow but after [they] slow down. âBut in the last laps I was more in trouble, and I missed these two or three tenths.